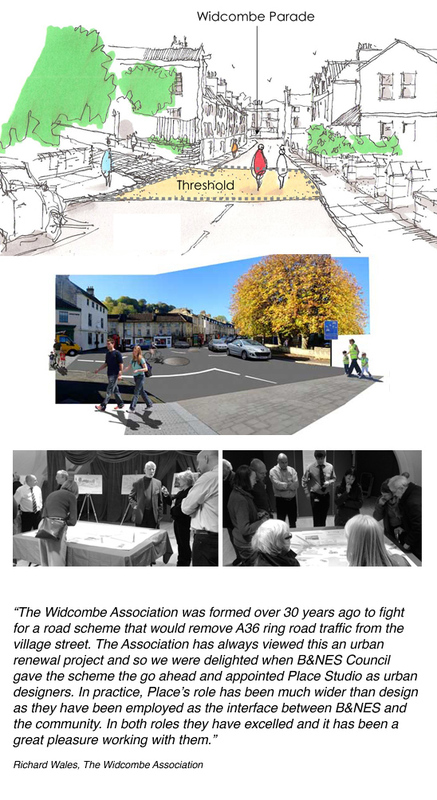 For thirty years the community linked to Widcombe Parade has campaigned for the Parade - their high street - to be relieved of A-road traffic, all with no effect. In 2013, Bath and North East Somerset Council committed to a scheme. Place Studio were appointed to lead community liaison and engagement and public realm design, supporting the project steering group and B&NES Council officers in delivering the £2m scheme to restore the Parade to a vibrant village high street and redirect A36 through traffic. Within very tight deadlines, Place Studio worked closely with the community and council officers to generate an integrated scheme. We designed, delivered and reported an intensive stakeholder and community engagement process that included informal workshops with key stakeholders and an all day drop-in as part of the design process. - A design to deliver low speeds, incorporating significant enhancements for pedestrians, cyclists and public transport within a simplified de-cluttered townscape. - Maintenance of valued street parking and new delivery capacity. - A simple, high quality specification that enables the historic frontages and landscape to take precedence, whilst creating a canvas for the streets public life. After 30 years of waiting by the community, the scheme was approved for implementation in Spring 2014 and is now nearing completion.